His Sire's Greatest Son! Super Stout, Super Sound and Super Good! This remarkable individual is destined to be one of the most popular AI sires of the decade. His combination of muscle, bone, correctness and eye appeal sets him in a class of his own. Adding to that, his disposition and hair could not be better. Pictured in the 'buff' at 18 months of age with no clipping except his head. Whether searching out a sire to use for great steers, dynamite females or herd sire sons...you can bet for certain that he is a grand slam! 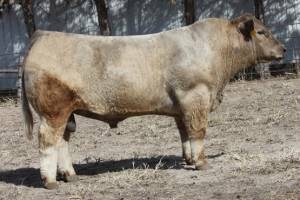 THF/PHAC, thus he will be a first choice sire to be bred to many females in the industry.